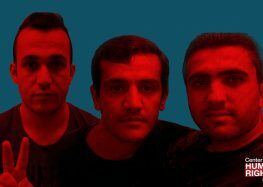 Three political prisoners serving life sentences have been transferred from Rajaee Shahr Prison in Karaj, west of Tehran, to Orumiyeh Central Prison in West Azerbaijan Province, 444 miles away, without a court order. The Center for Human Rights in Iran (CHRI) has learned that Mohammad Nazari, Khalid Fereydouni, and Omar Faghihpour were moved on November 16, 2017, after being beaten by guards in the clinic of Rajaee Shahr Prison. “On November 15, , a prison guard named ‘Mollazadeh’ became angry and started slapping Mohammad Nazari when he complained to prison clinic staff about why he wasn’t receiving any treatment,” a source inside Rajaee Shahr Prison told CHRI on November 17. In December 2016, political prisoner Saeed Shirzad sewed his lips shut and went on hunger strike to protest what he described in a letter sent to judicial officials as “the quiet death of prisoners” in Rajaee Shahr Prison at the hands of guards and prison officials. Nazari, Fereydouni and Faghihpour were arrested separately in the 1990s and sentenced to death for their alleged membership in the Democratic Party of Iranian Kurdistan (PDKI), an organization seeking autonomy for the mainly-Kurdish populated region of northwestern Iran. On July 30, 2017, Nazari went on hunger strike for nearly 100 days to demand a review of his sentence. He believes he is eligible for release based on articles 10, 99, 120 and 728 of Iran’s Islamic Penal Code. Membership in the PDKI is no longer considered a crime in Iran according to the most recent version of the code, which was revised in 2013. Nazari required specialized medical after he ended his prolonged hunger strike on November 6, the source inside Rajaee Shahr told CHRI.